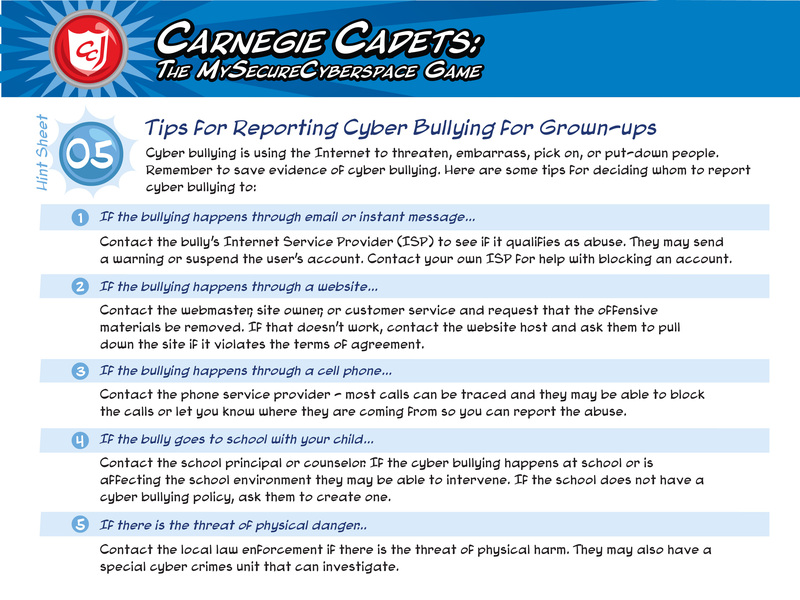 Carnegie Cadets: The MySecureCyberspace Game has been played in the classroom, at community centers, and for home school activities. To help educators along, the documents below provide ideas and materials that support the use of the game in a learning environment. 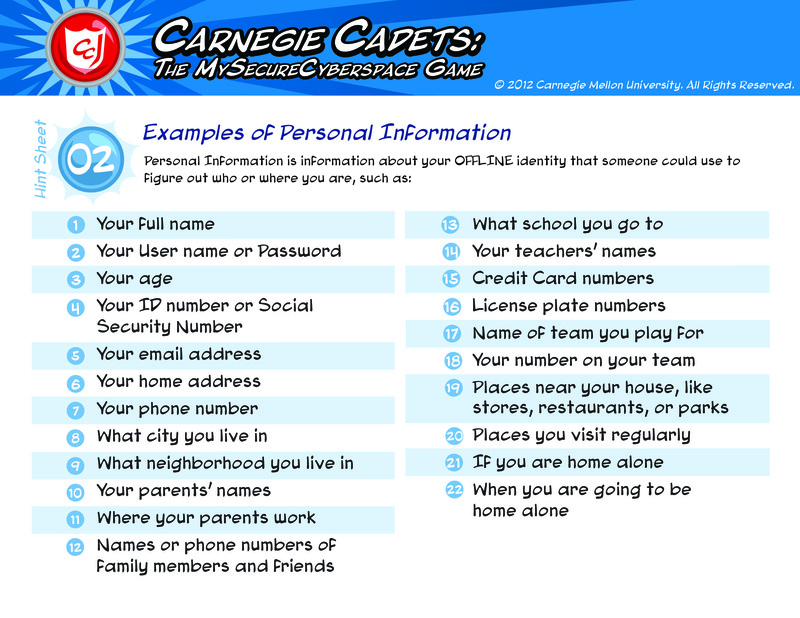 The Teacher's Companion gives educators an introduction to The MySecureCyberspace Game and Academy Web site and 13 lesson starters to help them get started with the game in the classroom. Each lesson starter contains terminology, background information and classroom activities, as well as an outline of learning objectives and learning objective outcomes, and corresponding standards from the National Educational Technology Standards (NETS). For best printing results, print double-sided. The faculty pages and games in the Fun Stuff section also provide educational information that you can use in a classroom. 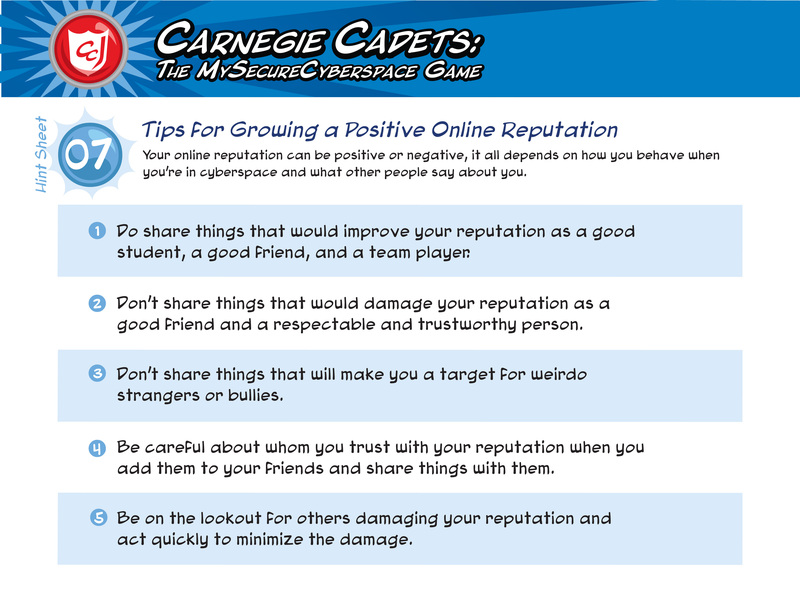 Cyberspace Communications (Betty) - tips for communicating safely online, detailed examples of personal information that it is unsafe to share online, and some tips for netiquette. Computer and Device Defense (Dr. Keen and Scout) - cyber defense tips and detailed descriptions of cyber threats such as viruses. Cyber Crimes and Criminals (Officer Ward) - descriptions of cyber crimes such as spamming and profiles of the cyber criminals in the Game. Green Computing (Trey) - descriptions of environmental issues related to computers and tips for reducing your environmental impact. The Academy Library (Maya) - tips for effective Web research and for determining if a site is a reliable resource. These print outs and activities are already included in the Teacher's Companion. They are provided here individually if you would like to make extra copies. Refer to the Teacher's Companion for instructions on how to use these in the classroom. The User Manual provides a game description and setup instructions. 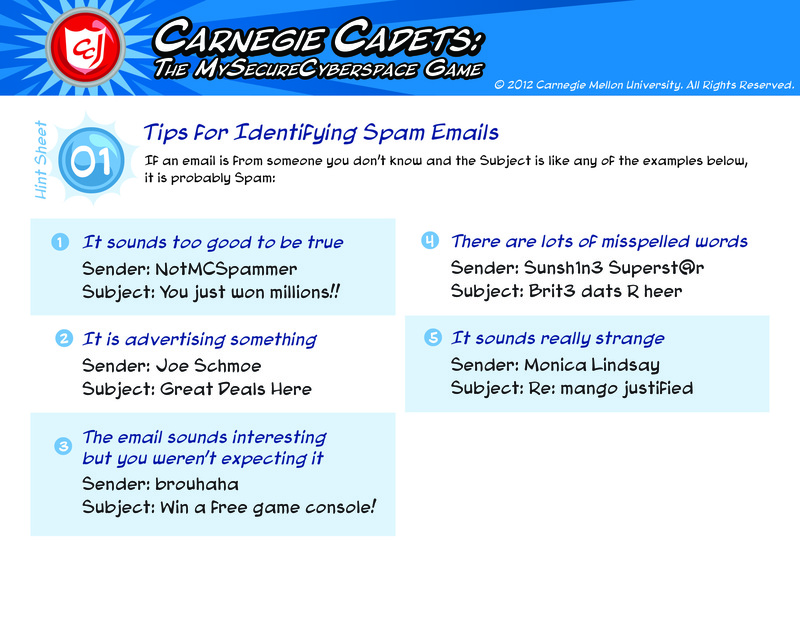 Also, see Help for answers to common questions. "The Path Forward, Inc." is proud to offer you our anti-bullying coloring book that we developed. 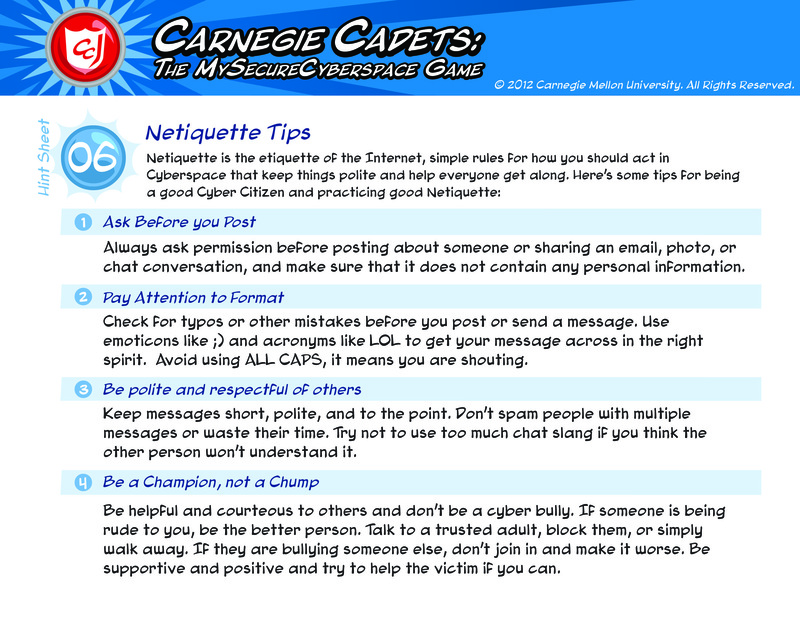 You will note that it uses the Four Anti-Bullying Rules from the Olweus Bullying Prevention Program. We received permission from Hazelden Publishing who owns the copyright to the Olweus Program to use these rules and they are cited appropriately. The book is for grades k-4. There will be a Spanish version of the book. Thank you for your kind attention. If you are interested in the book, please let us know. Stuart the Safety Bot and the Carnegie Library of Pttsburgh want you to stay safe and have fun while you explore the Internet. 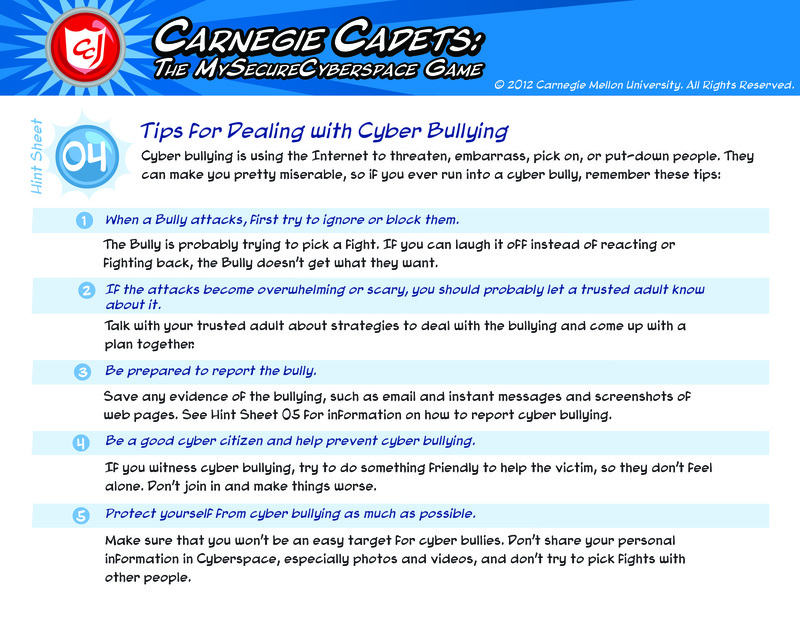 They offer tips and links to Web sites for you to learn how to be smart and safe online.